On November 9, 2012, I went to my favorite spot on the east side of Owasco Lake in the Town of Niles, Cayuga County. I got to the stand at about 3:00 p.m. and waited about 20 minutes before I rattled for one minute. I knew the rut was going hot and heavy and as soon as I put the horns down and looked up, this guy was coming straight for me across a wide open clover field. He made a B-line right to me and was coming in head on, so no shot. I drew when he got within 30 yards, he kept coming right in to within 10 yards. Then he realized something wasn't right and he looked right up at me and saw me in the tree. We had a stare down for a few seconds (seemed like an eternity) and he turned to run. He took a few steps but stopped perfectly quartering away at 19 yards where I slammed him right in the boiler room with a 100 grain, 3 blade, Spitfire, launched from my Martin Cheetah. Double lung and his day was done! Waited an hour and found him about 150 yards from the stand in a thicket. Best hunt ever, wasn't in the stand 30 minutes. Couldn't ask for anything more! 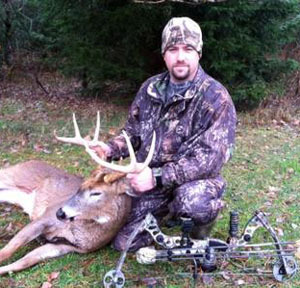 Dans buck is an 8-point with an inside spread of 18 1/4". The main beams are 22" exactly on both sides. The buck scores 118 and weighs in at 145 lbs. dressed. Age- 3 1/2 years.